Trends, topics, and trending topics. I’ve developed a text-mining strategy that identifies what I call “trending topics” — with apologies to Twitter, where the term is used a little differently. These are diachronic patterns that I find practically useful as a literary historian, although they don’t fit very neatly into existing text-mining categories. A “topic,” as the term is used in text-mining, is a group of words that occur together in a way that defines a thematic focus. Cameron Blevin’s analysis of Martha Ballard’s diary is often cited as an example: Blevin identifies groups of words that seem to be associated, for instance, with “midwifery,” “death,” or “gardening,” and tracks these topics over the course of the diary. “Trends” haven’t received as much attention as topics, but we need some way to describe the pattern that Google’s ngram viewer has made so visible, where groups of related words rise and fall together across long periods of time. I suspect “trend” is as a good a name for this phenomenon as we’ll get. From 1750 to 1920, the prominence of color vocabulary increases by a factor of three, for instance: and when it does, the names of different colors track each other very closely. I would call this a trend. Moreover, it’s possible to extend the principle that conceptually related words rise and fall together beyond cases like the colors and seasons where we’re dealing with an obvious physical category. Google data graphed with my own viewer; if you compare this to Google's viewer, remember that I'm merging capitalized and uncapitalized forms, as well as ardor/ardour. 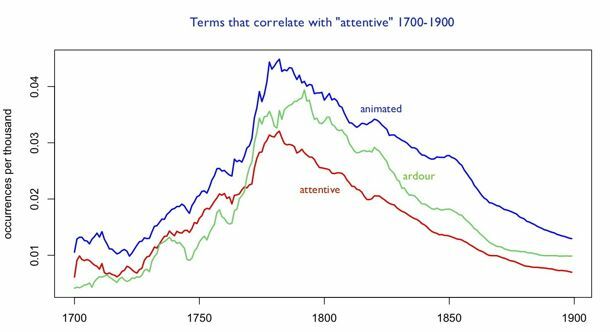 “Animated,” “attentive,” and “ardour” track each other almost as closely as the names of primary colors (the correlation coefficients are around 0.8), and they characterize conduct in ways that are similar enough to suggest that we’re looking at the waxing and waning not just of a few random words, but of a conceptual category — say, a particular sort of interest in states of heightened receptiveness or expressivity. I think we could learn a lot by thoughtfully considering “trends” of this sort, but it’s also a kind of evidence that’s not easy to interpret, and that could easily be abused. A lot of other words correlate almost as closely with “attentive,” including “propriety,” “elegance,” “sentiments,” “manners,” “flattering,” and “conduct.” Now, I don’t think that’s exactly a random list (these terms could all be characterized loosely as a discourse of manners), but it does cover more conceptual ground than I initially indicated by focusing on words like “animated” and “ardour.” And how do we know that any of these terms actually belonged to the same “discourse”? Perhaps the books that talked about “conduct” were careful not to talk about “ardour”! Isn’t it possible that we have several distinct discourses here that just happened to be rising and falling at the same time? In order to answer these questions, I’ve been developing a technique that mines “trends” that are at the same time “topics.” In other words, I look for groups of terms that hold together both in the sense that they rise and fall together (correlation across time), and in the sense that they tend to be common in the same documents (co-occurrence). My way of achieving this right now is a two-stage process: first I mine loosely defined trends from the Google ngrams dataset (long lists of, say, one hundred closely correlated words), and then I send those trends to a smaller, generically diverse collection (including everything from sermons to plays) where I can break the list into clusters of terms that tend to occur in the same kinds of documents. I do this with the same vector space model and hierarchical clustering technique I’ve been using to map eighteenth-century diction on a larger scale. It turns the list of correlated words into a large, branching tree. When you look at a single branch of that tree you’re looking at what I would call a “trending topic” — a topic that represents, not a stable, more-or-less-familiar conceptual category, but a dynamically-linked set of concepts that became prominent at the same time, and in connection with each other. 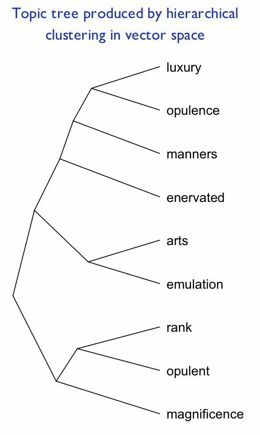 Here, for instance, is a branch of a larger tree that I produced by clustering words that correlate with “manners” in the eighteenth century. It may not immediately look thematically coherent. We might have expected “manners” to be associated with words like “propriety” or “conduct” (which do in fact correlate with it over time), but when we look at terms that change in correlated ways and occur in the same volumes, we get a list of words that are largely about wealth and rank (“luxury,” “opulence,” “magnificence”), as well as the puzzling “enervated.” To understand a phenomenon like this, you can simply reverse the process that generated it, by using the list as a search query in the eighteenth-century collection it’s based on. What turned up in this case were, pre-eminently, a set of mid-eighteenth-century works debating whether modern commercial opulence, and refinements in the arts, have had an enervating effect on British manners and civic virtue. Typical examples are John Brown’s Estimate of the Manners and Principles of the Times (1757) and John Trusler’s Luxury no Political Evil but Demonstratively Proved to be Necessary to the Preservation and Prosperity of States (1781). I was dimly aware of this debate, but didn’t grasp how central it became to debate about manners, and certainly wasn’t familiar with the works by Brown and Trusler. I feel like this technique is doing what I want it to do, practically, as a literary historian. It makes the ngram viewer something more than a provocative curiosity. If I see an interesting peak in a particular word, I can can map the broader trend of which it’s a part, and then break that trend up into intersecting discourses, or individual works and authors. Admittedly, there’s something inelegant about the two-stage process I’m using, where I first generate a list of terms and then use a smaller collection to break the list into clusters. When I discussed the process with Ben Schmidt and Miles Efron, they both, independently, suggested that there ought to be some simpler way of distinguishing “trends” from “topics” in a single collection, perhaps by using Principal Component Analysis. I agree about that, and PCA is an intriguing suggestion. On the other hand, the two-stage process is adapted to the two kinds of collections I actually have available at the moment: on the one hand, the Google dataset, which is very large and very good at mapping trends with precision, but devoid of metadata, on the other hand smaller, richer collections that are good at modeling topics, but not large enough to produce smooth trend lines. I’m going to experiment with Principal Component Analysis and see what it can do for me, but in the meantime — speaking as a literary historian rather than a computational linguist — I’m pretty happy with this rough-and-ready way of identifying trending topics. It’s not an analytical tool: it’s just a souped-up search technology that mines trends and identifies groups of works that could help me understand them. But as a humanist, that’s exactly what I want text mining to provide. This entry was posted in 18c, 19c, methodology, ngrams, topic modeling by tedunderwood. Bookmark the permalink. I was extremely pleased to discover this page. I wanted to thank you for your time for this particularly fantastic read!! I definitely really liked every bit of it and I have you book marked to see new things in your blog.